Atlantic Bank, AtlaXpress is available in your neighborhood. AtlaXpress is a service that allows customers to use their Atlantic Bank Visa Debit Card to perform financial transactions in the convenience of their neighborhood. 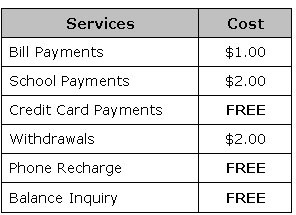 Customers can do a balance inquiry; withdraw funds; make bill, school and credit card payments, as well as recharge their cellular phone. Atlantic Bank customers can make Bill, School and Credit Card Payments; cash withdrawals, balance inquiry and phone recharge. Non-Customers can also make Bill, School Payments; and phone recharge by simply paying cash for their transactions. AtlaXpress Merchants are conveniently situated at supermarkets and gas stations near you. Click HERE for a list of merchants.